We now offer a second location in Los Gatos at the corner of Samaritan Drive and Los Gatos Boulevard! View contact information. Conveniently located off Highway 280 in the heart of Silicon Valley, Advanced Dermatology and Skin Surgery offers comprehensive skin care for medical and cosmetic needs. 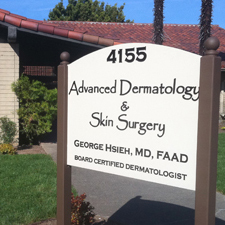 Dr. George Hsieh is a board certified dermatologist with special interest in aging skin and cosmetic dermatology. Dr. Hsieh also cares for a broad spectrum of conditions of the skin, hair, and nails. Follow us on Facebook for special events! Copyright © 2011–2016 Advanced Dermatology & Skin Surgery. San Jose Dermatologist 95117.